Pay your bills without leaving the comforts of your home via GCash. This is a faster and safer way to pay your utility bills, telecom, credit card bills simply by using your mobile phone. GCash is a micropayment service by Globe Telecom. 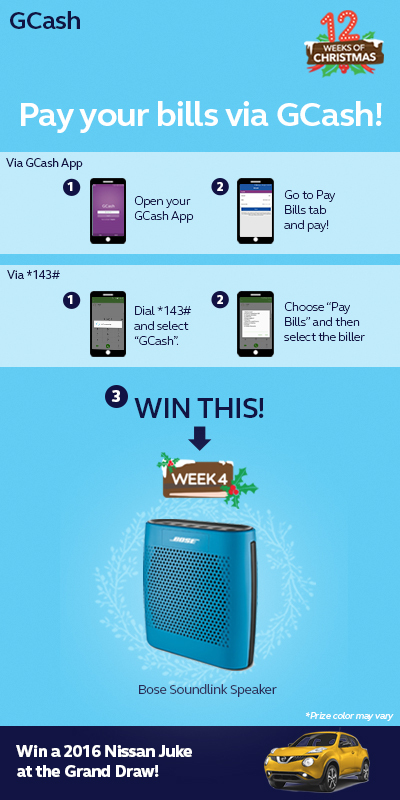 And because it is almost Christmas, paying your bills via GCash entitles you to join the Christmas Raffle Promo and get a chance to win a Bose Soundlink Speaker and a 2016 Nissan Juke. Dial *143# for FREE using your Globe/TM SIM. Step 2. Select Register and key in your personal information. Step 1. Download the GCash App for free from Google Play, BlackBerry World, iTunes, or Windows Store. Step 2. Open the app and select "New to GCash?" Step 3. Key in your personal information. Every week leading to Christmas, we will be giving out gifts to our GCash customers as they accomplish certain GCash tasks. To qualify for the October 21 – October 27 promo, a GCash customer must successfully pay their bills using GCash via *143# or the app to earn one (1) entry. This week’s raffle draw is on October 28. This promo is open to all users of GCash who are currently residing in the Philippines. Only entries accumulated within a given period shall qualify for a specific draw. Winners of the weekly draw can also win in the grand raffle draw and also can join the next weekly raffle draws. Winner should be a transacting subscriber and not a transacting partner. Prizes are not transferable and non-convertible to cash. All GCash employees including their relatives up to the second degree of affinity or consanguinity are disqualified in joining the promo. Winners will be notified through registered mail, FB post, and a call from a GCash representative. Prizes will be delivered to the winners as reflected in their registered address. Final taxes on the cash credit prizes as well as the registration and other related expenses on the vehicle will be shouldered by GCash. Winners can claim the prize until 60 days from the receipt of notification, unclaimed prizes should be forfeited.